As I mentioned in my last post, we have a few fundraisers planned in the next few weeks to help us pay for the upfront costs of our adoption. Our goals is to pay for and complete our home study in the next couple of months. Here's the fundraisers as well as suggestions for how YOU can participate with us!! 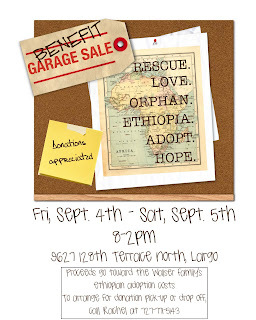 Our awesome friends the Hoffmans are hosting a garage sale for us on Sept. 4th & 5th. If you live locally and would like to donate items to our sale, you can email me and arrange for pick-up or drop-off of items. If you are not local but would still like to donate items for us to sell on craig's list or ebay, please email me and let me know. We are super excited about this one! 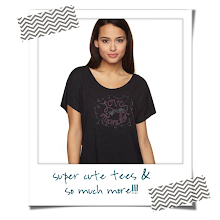 We personally LOVE the shirts we have designed and think you will, too! As soon as the artwork is finalized, I will post it here. These shirts will be available to purchase on this blog using paypal or by contacting me directly. I am hoping you will want one just because they are cute, but I also hope you will buy one and wear it with pride, shining light on the mission of God's redemption through adoption to those around you. I will have more details in a few days, so stay tuned. 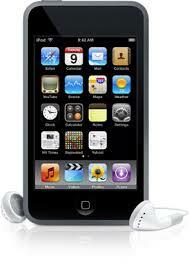 Fundraiser #3: Online Raffle We will be raffling off an ipod touch. Tickets will be $5 a piece, or 5 for $20. Tickets will be available for purchase on this blog or by contacting me directly. If you would be willing to help us sell raffle tickets, we would mail tickets to you to sell to your friends, coworkers and neighbors. It's all for a good cause, and who couldn't use an ipod?! If you are willing to help in this way, please email me and let me know. We are asking that you set a goal to sell 25 tickets. (The person who sells the most tickets will get a FREE tshirt!!) We will send you a packet of info including tickets, flyers/info on our adoption, and a self-addressed stamped envelope to mail your tickets and money back in. So that's the plan! If you would like to participate in any of these fundraisers with us, please email me and let me know or post a comment below. Thanks! 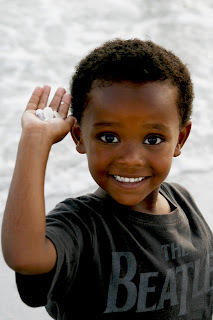 Why international adoption and why Ethiopia? I have to confess, I almost cheated on this one. I’ve heard and seen wonderful explanations on blogs and websites articulating far better than I ever could the reasons to adopt, to adopt internationally, and to adopt from Ethiopia. Beautiful, eloquent and heart-wrenching. The statistics are staggering when it comes to the need just because of the sheer number of kids who are orphaned & abandoned. I figured, no one would mind if I did a little cut and paste. : ) Because, truly, they are good reasons. But you didn’t ask why they adopted from Ethiopia. You asked why we are adopting from Ethiopia. As I mentioned before, Joe and I have always been open to adoption, but never felt the Lord give us clear direction or a specific timeline on how to proceed. So we decided to remain open and see how the Lord might lead. Honestly, the whole thing was slightly overwhelming to me as to how to even begin adopting, and with all the other things on our plate, I decided He would have to give us clear direction through a person or agency or association, and we would go from there. I actually thought if we ever did adopt, it would be a domestic adoption—connected to a specific child we met, perhaps while serving a local orphanage. We heard their story, felt their heart for Ethiopia, and caught their excitement and vision for all that God could do though a small group of people dedicated to loving and serving the people of this country. As a church, we were moved. Another couple, already planning to adopt internationally, decided to adopt from Ethiopia. Our church mission trip, which had been originally planned to Guatemala but had to be canceled, was rescheduled to Ethiopia in January of 2010. And we began paperwork to start an adoption assistance fund & ministry in our church, where we as a church can support families who are feeling called to adopt. In a short amount of time, our church was developing an international arm of ministry to a specific country in specific ways. And all the while, we felt God moving in Joe and myself. 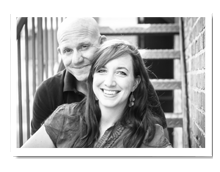 As soon as we met Dave and heard that they had adopted, Joe and I knew it was no accident that they were becoming a part of LifeBridge Church. To have someone who had “been down that road” and had a heart to help others walk that same road, seemed too good to be true. Let me add something else to the mix. When Joe and I felt called to plant a new work, I thought we’d end up overseas. Our heart had been broken for the poor and we longed to be a part of bringing justice to those who live in abject poverty. We were ready to abandon everything and just go. But God led us to stay in the U.S. and to plant a church in this country, which is the 5th largest mission field on the planet. Quite frankly, I was bummed at first. It seemed easier to me to go to a country where these trappings and trinkets wouldn’t be there to distract me from my contentment in Jesus and Jesus alone. Where I would be “on mission” every moment instead of getting sucked in to the rat race, and the desire to accumulate things would seem silly and trite. A place where I would always know and tangibly sense…this is not my home…my home is in heaven. Why did we come to Florida to plant a church? Because God told us to. Despite what we thought, he wanted us here and we know we are in the center of His will. And why are we adopting from Ethiopia? Because God told us to. I wish I had something more for you to sink your teeth into, but all I can say is, it is our family’s way of loving the world in a tangible way. We will serve in soup kitchens and play with orphans and visit retirement homes right here in this county. But our family will seek social justice for the poor in this world-- as God commands us to-- in a more permanent and sustained way through adoption. We feel God is using us locally. This is how He will use us globally. It isn’t everyone’s reason. It isn’t everyone’s story. But it’s ours. Our application has been approved!! We received the call yesterday! 4 days--crazy fast! Yippee! We are through the first round of scrutinization (or so it feels) as we prepare to adopt. The paperwork has just begun, but we embrace it, knowing what joy is to come! A fun “coincidence”: We received a book in the mail from our denomination, sent to our church P.O.box for Joe. They often send resources as support for Joe as a church planter. Barbara handed it to me last night at Bible study, and guess what the book is?? “Adopted for Life” by Russell Moore! NO way!!! Or rather, of course! The Lord has laid the steps and confirmed our decisions. Maybe we ARE crazy. Walsers are not known for taking the path of least resistance. Things are perfectly fine the way they are, and one could argue we’ve got enough on our plate as it is. And yet we have chosen this path anyway. We had decided to adopt a child from Ethiopia. Why? I’ll explain the best I can. A few years ago, Joe and I could not shake the feeling that God was asking more from us than we were willing to give. We felt that we had committed to serving him with our lives, and had been doing so by serving in full time ministry. Ministry has its perks, but it is not an easy road nor is it a money-making scheme. But we had carved out a pretty comfortable and secure life in a place we enjoyed surrounded by people we enjoyed, and we were doing what we enjoyed. None of that was bad in and of itself. But we both knew that the life we had was one we had orchestrated to be how we wanted it to be, with little room for risk. So we decided to step out and risk it all—plant a church in a state we had never lived in with three friends in tow. So there were five of us. And we knew almost no one. We left our home, our friends, our paycheck…behind. It’s been scary at times and there are still days we don’t know how it will all play out. But there is no doubt in our minds that God called us here. And He called us here not just for the church, although He does want us to give our lives away for it. And not just for the lost, although we seek daily to be used to reach them. But also for US--for His process in us, our dependence on Him and our daily dying to ourselves. Which brings me to this decision we have made. It is amazing to me how easy it is for me to slip back into a routine and life where I am comfortable and isolated. It’s like in Isaiah 58 when God says “On the day of fasting, you do as YOU please…” (vs. 3). On the surface, I am offering my sacrifice, but it is still on MY terms and when it is convenient for me. But I do not want to live that way. I want a life full of risks. I want to live and love with abandon. I want to live like I believe the gospel is true. In fact, I want my life and the decisions I make to only make sense in light of faith. In other words, that I MUST believe in something unseen, some future hope, some invisible kingdom. If my life can be dismissed, my decisions explained by any other reason, then I have failed to be the light and salt I am called to be. 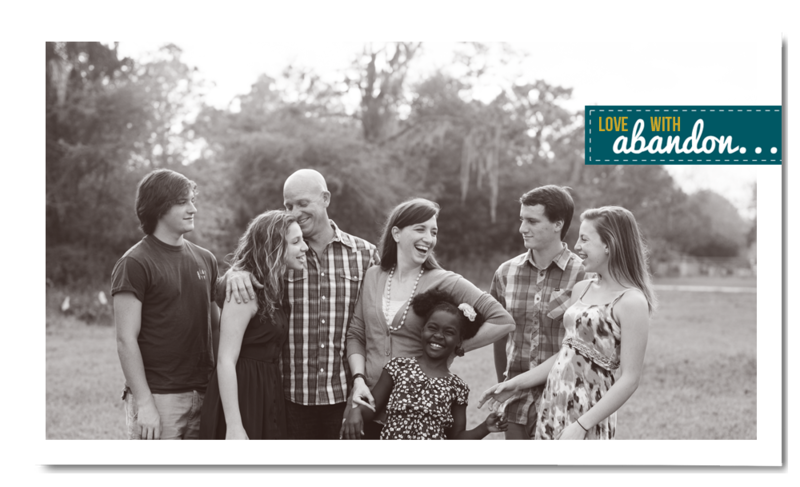 For years, Joe and I have both said we were open to adoption if God ever called us to do so. As John Piper says, adoption is the heart of the gospel and the clearest picture of what God has done for us. And it had become clear to us in the last few weeks, that He is calling our family to be a living example through adoption…so we are obeying. You may have many questions about the whens and whys and hows of our decision (as do we! : ) ), and I hope to answer some of those with my postings on this blog. (If you have a specific question, feel free to post as a comment.) I invite you to subscribe to email updates in the link to the right, bookmark it, follow it however works best for you---and keep up with us as we embark on this journey. For now, watch this brief video as John Piper talks about adoption as God’s plan from the beginning…and be encouraged. And please pray for us. We’d be grateful.